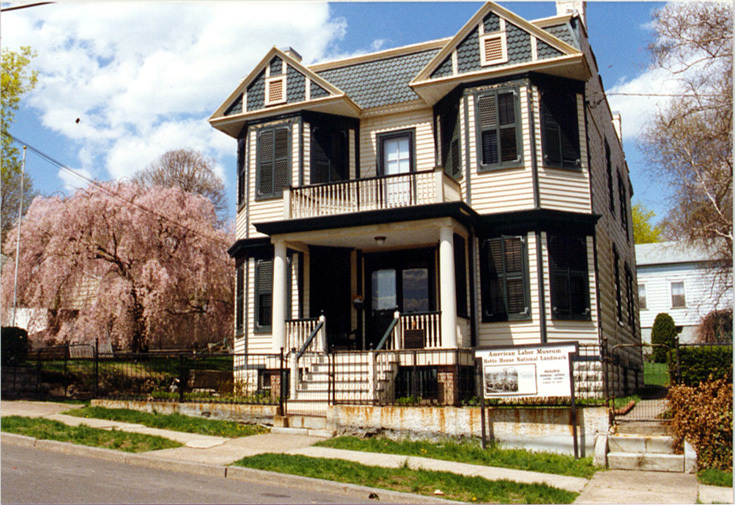 The American Labor Museum is housed in the 1908 Botto House National Landmark. The Botto House was built for and owned by Italian immigrant and silk mill worker, Pietro Botto and his wife Maria. From the balcony of the Botto House in 1913, labor union organizers of the Industrial Workers of the World (IWW) addressed as many as 20,000 silk mill workers who were on strike for an eight-hour workday. Because it served as a haven for free speech and assembly for these laborers, the Botto House was placed on the State and National Register of Historic Sites in 1975. In 1982, the Botto House became a National Landmark when the United States Department of the Interior placed it on the nation's most distinquished roster of historic sites. In 1983, it opened to the public as a museum dedicated to teaching the public about the history and contemporary issues of workers, the workplace, and organized labor with special attention to the ethnicity of working people. The American Labor Museum is a non-profit 501(c) educational institution. The museum features changing exhibits, restored period rooms and Old World Gardens that reflect the lifestyle of an immigrant family of the early 1900's, a free lending library (including books, audio and video cassettes, CD's and DVD's) and a Museum Store. Exhibit receptions, lectures, poetry readings, teachers' workshops and other special events are offered.